As reported in an editorial in today’s Irish Times, a special issue of the Journal of Irish Urban Studies has just been published, presenting work of the Urban Environment Project, a large-scale, multi-insitutional and multi-disciplinary collaborative research project led by UCD Urban Institute Ireland and funded by the Environment Protection Agency. Issues addressed by the special issue include biodiversity, city-regional governance, office location patterns simulated coastal flood risk and spatial planning. All articles in this issue are available to download here. The analysis below is extracted from one article of this special issue. The spatial extent of Dublin’s functional urban region or commuting hinterland has served as a key indicator and point of discussion on the ‘sprawl’ of Dublin and extent of uncontrolled urban expansion over the Celtic tiger period. The location of unfinished and partially vacant housing estates in some locations suggests that private developers significantly overestimated the extent of the ‘Dublin market’. 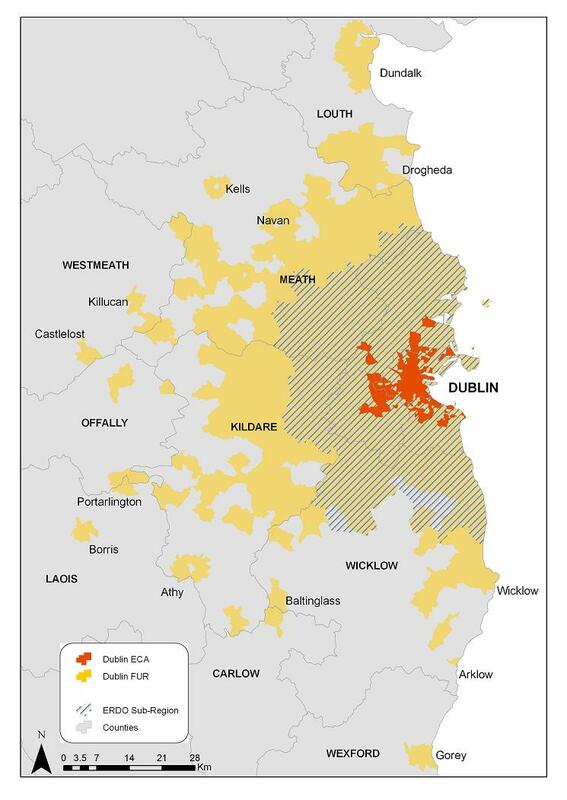 The analysis below serves to map the spatial extent of the Dublin functional urban region and identifies the share of the Dublin workforce commuting from the Mid-East Region (Kildare, Meath and Wicklow) and beyond. The criteria outlined above, are selected to reflect the actual spatial extent of the FUR based on daily commuting flows (Figure 2). In total 454 EDs are included within the 2006 FUR. The total FUR area covers 4,138 km2. For comparative purposes the spatial extent of the Dublin Sub-Region as defined by the ERDO strategy on the basis of 1981 data is shown in Figure 6.12. The area of the Dublin Sub-Region (2,016 km2) is less than half that of the 2006 FUR. Differences in methodology preclude further inferences to be drawn regarding the spatial expansion over the 1981-2006 period. With the exception of Togher, Calary and Altidore, located in north Wicklow, all EDs included in the ERDO sub-region are also included in the 2006 FUR. The principal contiguous area of the 2006 FUR extends to include all of the Dublin Region and large parts of northeast Wicklow, northeast and central Kildare, south and east Meath and southern Louth. Urban centres located at some distance from the principal contiguous area but included within the FUR include all or parts of Dundalk, Kells, Portarlington, Borris, Athy Baltinglass, Arklow, and Gorey. It should be noted that the spatial extent of the FUR as defined here is less than that defined by Williams et al. in the Society of Chartered Surveyors commissioned study (published in 2007). The FUR has not contracted between 2002 and 2006. Rather, improvements in data availability and methodological changes have allowed for a significantly more accurate assessment of the spatial extent of the Dublin Functional Urban Region. In total approximately 388,000 workers resident in the FUR in 2006 commuted to work in the Dublin ECA. This is however only 52% of the total number of resident workers in the FUR, indicating the continued significance of smaller dispersed centres of employment. 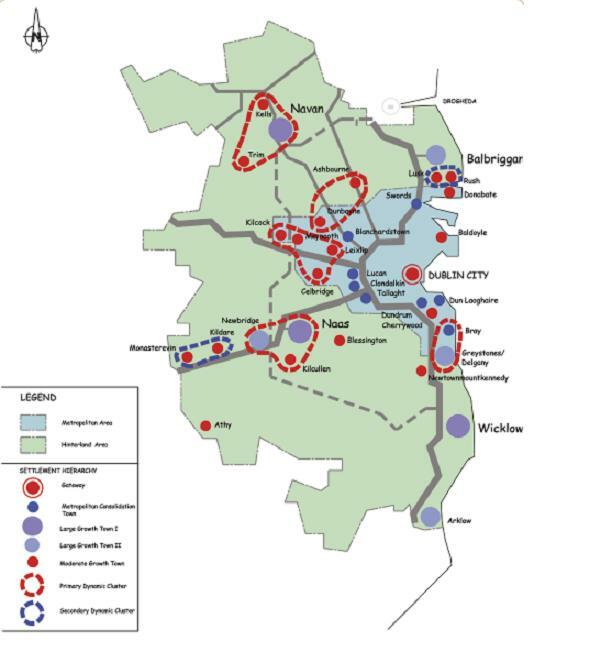 Figure 2: Dublin Functional Urban Region. Source: Census of Population 2006 POWCAR dataset, OSi boundary layers, OSi permit no. MP009006(c) Government of Ireland, ERDO Eastern Regional Settlement Strategy (1985). A county and regional level analysis of the workforce in the Greater Dublin Area is provided in Tables 1 and 2 below. The Greater Dublin Area workforce (defined by place of work) is composed of workers commuting to a fixed place of work (‘commuters’), those working primarily at home (‘home’ workers) and those with no fixed place of work (mobile’ workers). In this analysis mobile workers are excluded as their principal county of work is unknown. Almost 70,500 mobile workers are recorded with places of residence within the Greater Dublin Area. This compares to a total of 626,162 commuting to work in the GDA and 25,968 working from home in the GDA. The statistics in Table 6.2 include both commuters and home workers. The place of work of home workers is determined by their place of residence. The total number of jobs in the Dublin Region (525,204) was significantly higher than in the Mid-East Region (126,886) in 2006. Comparing with total population figures, however, provides a more meaningful basis for comparing the regional distribution of employment. There were approximately 442 jobs per 1000 population in the Dublin Region, compared with 267 jobs per 1000 population in the Mid-East Region. In total 82.6% of those at work in the Dublin Region were resident within the Dublin Region. An additional 13.4% are recorded as commuting from the neighbouring Mid-East Region. By comparison 77.6% of those at work within the Mid-East Region were resident within the Mid-East Region. 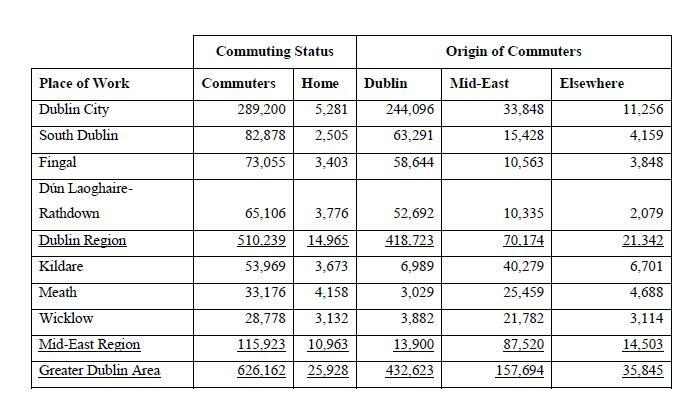 11.4% of those at work in the Mid-East Region commuted from beyond the Greater Dublin Area, a significantly higher proportion than for the Dublin Region. In total 35,845 workers are recorded as commuting from beyond to the GDA to places of work within the GDA. This figure, however, represents only 5.5% of the total workforce in the GDA. Williams, B. Walsh, C. & Boyle, I. (2010) The Functional Urban Region of Dublin: Implications for Regional Development Markets and Planning, Journal of Irish Urban Studies, vo. 7-9, p. 5-30. Please reference the published version! Note: the research was conducted as part of the Urban Environment Project, hosted by UCD Urban Institute Ireland and funded by the Environment Protection Agency. The author’s access to the Census of Population POWCAR dataset was possible by kind permission of the Central Statistics Office. 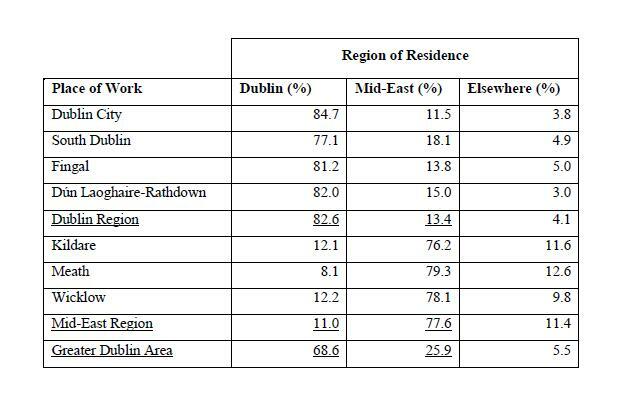 If mobile workers are assigned to their region of residence, this figure increases to 84.0% for the Dublin Region with a corresponding figure of 81.4% for the Mid-East Region. The NIRSA Working Paper, ‘A Haunted Landscape’ provides an analysis of the current situation of oversupply in the Irish housing market, focussing in particular on the uneven geography of housing development and so-called ghost estates as a very visible and tangible manifestation of the housing crisis. Ronan Webster of CB Richard Ellis, speaking at the Irish Planning Institute Autumn Conference last week characterised recent trends in housing development in Ireland in terms of a shift from a perception of undersupply to a perception of oversupply. Indeed the Bacon reports of the late 1990s and much official and academic commentary since have pointed to a situation of very significant undersupply in the Dublin Region in particular. It has been widely argued that the undersupply in the Dublin market has contributed to the displacement of urban-generated residential development to the Mid-East region and further afield in ‘Outer Leinster’ (see Society of Chartered Surveyors Housing Study). A Haunted Landscape, in the contrast, finds that residential development in Dublin City and Dun Laoghaire Rathdown (and Cork City) was far in excess of demand, while housing in Fingal, Kildare, Meath, Wicklow and South Dublin was ‘in line with demand’. Clearly different notions of undersupply (and by inference optimum supply) are at play here. From a social equity or planning policy perspective it is evident that there was an undersupply of suitable residential development in Dublin City and Dun Laoghaire Rathdown. This undersupply coupled with highly inflated and unaffordable prices inevitably contributed to the displacement of housing development beyond the boundaries of the Dublin metropolitan area. The characterisation of the housing situation in Dublin as one of oversupply betrays the influence of reductionist economics thinking but also reflects a spatial blindness. Housing supply in Dublin and Dun Laoghaire Rathdown cannot be understood in isolation from the analysis of housing supply in the Mid-East Region and wider Dublin housing and commuter catchment areas. 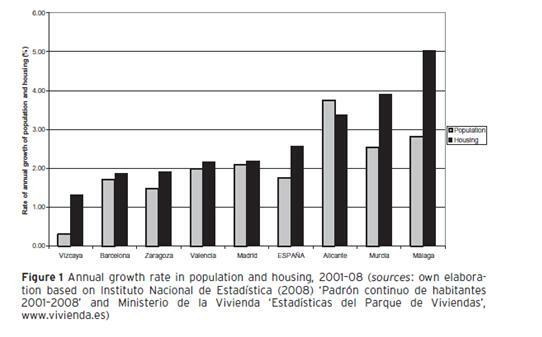 The high demand for housing in the Mid-East Region and associated unprecedented pace and scale of development over the housing boom period may in large part be understood as the consequence of the undersupply of appropriate (i.e. family friendly and affordable) housing in the Dublin Region. 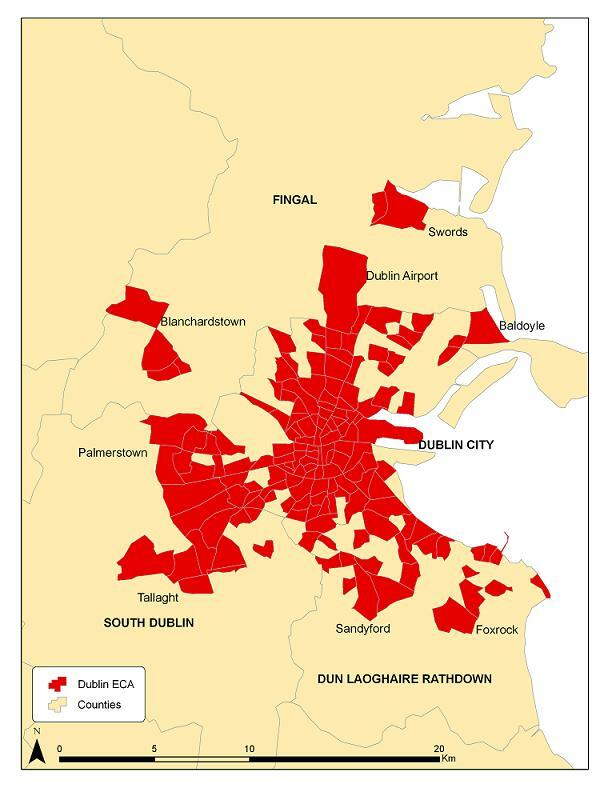 Planning policy as articulated at national, regional and local scales in fact strongly supported the concentration of residential development within the Metropolitan Area of Dublin and the designated development centres in the surrounding hinterland area (see map below). It is the failure of the State (central and local government) to provide the necessary infrastructure, services and regulation to support socially sustainable residential development within the Dublin Region that has led to the perverse situation of reported oversupply in the Dublin City and Dun Laoghaire Rathdown and supply in line with demand in neighbouring Hinterland counties. In order to fully understand the social, economic and political geography of Ireland After NAMA, we need to move away from interpretations of statistical data which serve to reinforce the fallacies of methodological territorialism (see Neil Brenner – New State Spaces…), where counties and other administrative units are understood as distinct spatial entities. Constructing a geography of flows and functional relationships creates challenges in terms of data gathering and analysis but must be seen as a neccessary step in highlighting the evident deficits in dominant aspatial and terrritorial interpretations.